LANCASTER – At a recent council meeting, the National Alliance for Faith and Justice (NAFJ) thanked the Lancaster City Council for its ongoing support of the organization, in particular the Council’s support of the successful Antelope Valley Mentoring March, which took place September 13, 2013. Inspired by the Martin Luther King Jr. Memorial March in Washington D.C., the NAFJ attracted more than a thousand local participants marching in honor of the civil rights accomplishments made possible by Dr. Martin Luther King Jr. and Cesar Chavez. Bishop Henry W. Hearns and Gwendolyn Cole showed gratitude for the City of Lancaster’s embrace of the NAFJ’s Pen or Pencil movement, which strives to keep children enrolled in school and out of trouble. 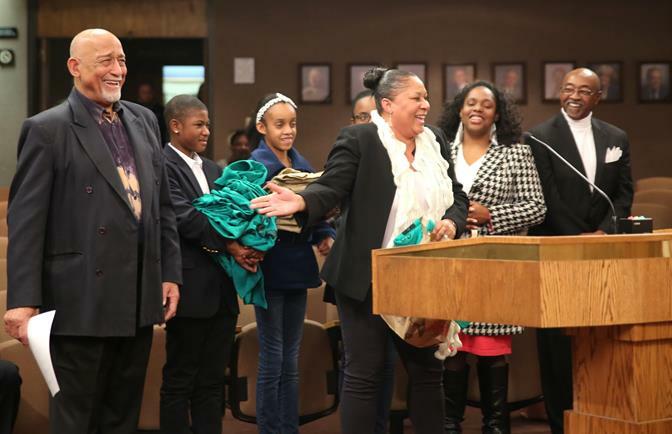 Three students from the NAFJ’s Pen and Pencil mentoring program then presented the City Council with t-shirts that were worn during their August 28th march in Washington D.C. In all, 15 students were able to travel to the nation’s capital to march in honor of the 50th Anniversary of Dr. King’s “I Have A Dream” speech.